Summertime always slows down for us with school being out and the calendar changes that we have, but this June has brought us new opportunities to visit some summer camps. We were able to participate in St. John and St Mark's Episcopal church summer camp located in the Radium Springs neighborhood. Also, Aspire began a summer camp this year at the Clubhouse on Dawson Rd and another location at Lee County Primary School and I am happy to say that we were able to participate. We had a good time teaching the children about our mission and teaching them the difference between Service Animals and AAi/AAE/AAT animals. We also touched on animal safety and care. The children really seemed to enjoy our visit. We held evaluations on Saturday, June 3rd. I would like to thank our Volunteers that assisted with evals, Meg & Max Farris, Betty Livingston and Beverly Nichols, THANK YOU SO MUCH!. We had three teams signed up, but we had one no-show and one team that received a N/R (not ready). I am thrilled to say that one team received a Complex Rating. Please join me in congratulating and welcoming, Donna Franklin and her Boxer, Bessie! We welcome this very sweet team and have already began visiting with them. We are having another Workshop on Saturday, July 8 and our next scheduled evaluations will be held on July 22. Please check your expiration dates and if your expiration date expires in June or September please register for an evalution renewal. Please contact Judy Himes at 312-4333 or jhimes@phoebehealth.com, if you would like to visit at Phoebe Facilities and have not yet taken their required Volunteer Class or the most recent annual update. Also, I want to remind everyone that to visit at Willson Hospice House or to participate in the Phoebe Hospice program you will also need to complete a Hospice Orientation Class in addition to the Phoebe Volunteer Orientation Class. To arrange to take the Hospice Orientation please contact Penny McCullough at 312-7050. Pet Partners has began a new initiative program titled "Walk with Me" I have ordered the information book for our convenience and to assist any of our teams that might wish to participate in this program. I will have this information along with the "Read with Me" information available at our next meeting. Please let me know if you would like to borrow them and read up on these two initiatives. You can also find information on www.petpartners.org website. I am planning our next Semi-annual Meeting to be held on Sunday afternoon, September 17, 2017, please save the date. Paws Patrol now has a PayPal account to be able to accept donations and I am hopeful that we can get this account linked to our website in the near the future. 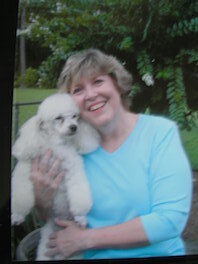 Spotlight Volunteer this month is Sandy Knight and Bella (a rescure Toy Poodle). Bella and Paws Patrol was an answered prayer. For several months I had the desire to find a ministry that would make a difference in people’s lives. Being a nurse for several years, enjoying caring for others and hopefully giving them comfort during difficult time and always being an animal lover, little did I know what God was preparing for me. In 2013 a puppy mill was broken up in Worth County were I live. One Saturday shortly after that, I went to the Worth County Humane Society to get a companion for the poodle I had at home. I informed the person at the Humane Society that I was looking for a poodle or poodle mix but was not interested in a dog rescued from the puppy mill. They said the only poodle they had was a white one rescued from the puppy mill. I agreed to see her and the rest is history. Bella came into our lives and is such a loving, sweet fur baby. Two years after Bella joined our family I was reading the Albany Herald, which I rarely do, and there was an article about Paws patrol. As I read I kept thinking, Bella would be great doing this! This was the ministry I had been looking for, combining my love for caring for people and my love for animals! I contacted Paula Patterson who got me in touch with Cheryl. I attended the workshop in May 2015. Bella and I evaluated in July 2015 and became a Paws Patrol team. Bella loves visiting, especially with children. Whenever she sees me get her bag, she gets all excited and ready to go. I am so thankful to have found Paws Patrol. It is so rewarding to see the smiles on those we visit and knowing Bella has brightened up their day. Please continue to keep Barbara, Richard and Charlye Harden in your thoughts and prayers!! Also please keep Linda (Grimes) & David Kohr in your thoughts and prayers! Wishing our June Birthdays, Paula Patterson and Cheryl Cohen a very HAPPY BIRTHDAY!